Beautiful certificate from the ValuJet, Inc. This historic document was printed by the Jeffries Banknote Company and has an ornate border around it with a vignette of the company's logo (cartoon jet) flying over the company name. This item has the signatures of the Company’s President and Chief Operating Officer, and Secretary. 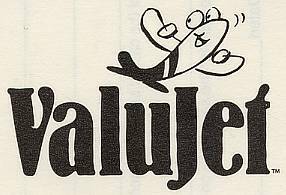 ValuJet Airlines, Inc., was a large regional airline that offered affordable, no-frills, limited-frequency, short-haul flights primarily in the eastern United States. Its no-frills philosophy allowed the airline to offer low fares and to attract travelers who would have otherwise used ground transportation. 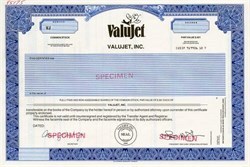 ValuJet Airlines was incorporated in July 1992 and became a wholly owned subsidiary of ValuJet Inc. in October 1995. In May 1996, an accident involving a flight from Miami to Atlanta, in which there were no survivors, dramatically changed the operations of ValuJet. Before the accident, ValuJet offered service to 31 markets from its hub cities of Atlanta; Washington, D.C.; and Boston. On June 17,1996, an FAA consent order resulting from the fatal crash required the company to suspend operations. ValuJet's rapid growth since starting no-frills service in 1993 came to a halt with the crash of Flight 592 in 1996, and a subsequent grounding. As a result, the company was forced to merge with AirTran Airways Corp to form AirTrans Holdings in 1997.